Tasmania's natural beauty is hard to match and there are few better ways to enjoy everything that Tasmania has to offer than by taking a camping holiday in your own car, car hire Tasmania, motorhome, campervan or by using public transport. Stunning coastal reserves and unspolit beaches, mountains, crystal clear lakes and rolling hills are available all across the island state of Australia, Tasmania or Tassie as it is often referred to by locals. The hardest part is deciding where to start, once you have travelled to Tasmania. Ccamping is a very popular family activity in Tasmania, with commercial caravan parks in Tasmania plentiful, affordable and generally in good condition. Campsites are tent friendly with lots of space for you to pitch your tent on grass plots, a change from gravel options available in some countries. Most sites also offer self-contained cabins, on-site vans, four wheel drive, caravans or some other form of hard accommodation for varying degrees of luxury. Standard facilities are usually supplied and Tasmanian tourism and travel operators are renowned for their friendliness and willingness to help. Camping is an affordable and fun way to truly experience Tasmania. Throughout Tassie will find a wide range of different locations and experiences. Opportunities exist to stay in a wide range of accommodation ranging from free camping sites through to park motels. We wish you an enjoyable camping experience in Tasmania , the opportunity to meet great people within our parks, both guests and owners and above all have a wonderful time. Tasmania boasts a fabulous range of free and paid camping areas, the equivalent of which you won't find anywhere else in the world. Many of Tasmania's national parks and reserves offer excellent camping options which allow you to fully appreciate the beauty and uniqueness of the area you are visiting. A small number of parks offer cabin style accommodation; Mt Field Government Huts are an excellent example of hut style accommodation in a Tassie National park. When camping in National Parks in Tasmania, please remember that camping and accommodation fees are in addition to national park entry fees. 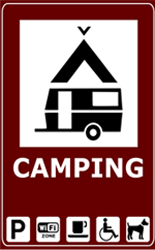 Fees apply only to the campground or accommodation for which they are paid and are not transferable to other campgrounds or accommodation in the state. Please note that dogs are not allowed in national parks and most reserves in Tasmania, which is strictly enforced. Please also note that rubbish bins are not provided in parks and reserves - you are responsible for removing all waste.